Can I run tests not included the module? I don't have access to the PowerShell Gallery, how can I download this? 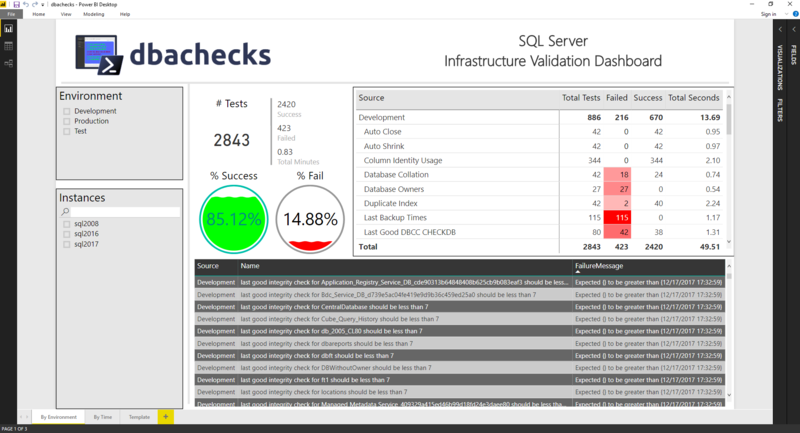 dbachecks is a framework created by and for SQL Server pros who need to validate their environments. Basically, we all share similar checklists and mostly just the server names and RPO/RTO/etc change. Have questions about development? Please visit our Wiki. Anyone developing this module should visit that Wiki page (after fully reading this readme) for a brief overview. Automatic installation of the dependent modules will only be provided via the PowerShell Gallery. dbachecks uses dbatools for most of it's data gathering so it supports SQL Versions from SQL 2000 to SQL vNext including SQL running on Linux. (dbachecks will not install on PowerShell Core yet so can not be run on a Linux client) Obviously some of the Services adn disk space checks will not work against instances running on Linux as they are usin gWindows API calls. Checks are performed using Invoke-DbcCheck which is basically a wrapper for Invoke-Pester. This means that supported Invoke-Pester parameters work against Invoke-DbcCheck. In this module, a "Check" is synonymous with a "Tag" in Pester. So you can Invoke-DbcCheck and specify a Check that you want to run. You can see a list of the available Checks with Get-DbcCheck. Once you've decided on the Check(s) you want to run, it's time to ensure you have a list of servers to run the checks against. 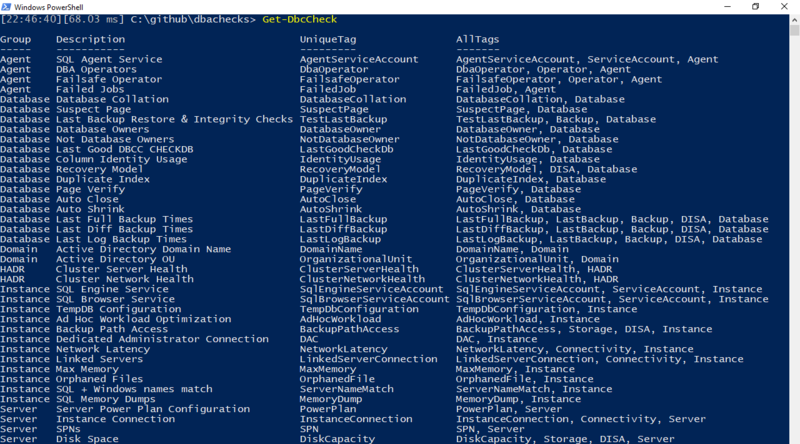 Similar to the dbatools module, dbachecks accepts -SqlInstance and -ComputerName parameters. If you have a simplified (single) environment, however, you can set a permanent list of servers. "Servers" include both SQL Server instances and Windows servers. Checks that access Windows Server (e.g. disk space checks) will utilize -ComputerName parameter. A pure SQL Server command(s) (such as the backup check) utilizes the -SqlInstance parameter. We tag each of our Checks using singular descriptions such as Backup, Database or Storage. You can see all the Pester related Tags using Get-DbcTagCollection or Get-DbcCheck. Each Check generally has a few Tags but at least one Tag is unique. This allows us to essentially name a Check and using these Tags, you can either include (-Check) or Exclude (-ExcludeCheck) in your results. The Exclude will always take precedence. For example, the Database Tag runs a number of Checks including Backup Checks. The command below will run all Database Checks except for the Backup Checks. All valid Pester syntax is valid for dbachecks so if you'd like to know more, you can review their documentation. Since this is just PowerShell and Pester, results can be exported then easily converted to pretty reports. 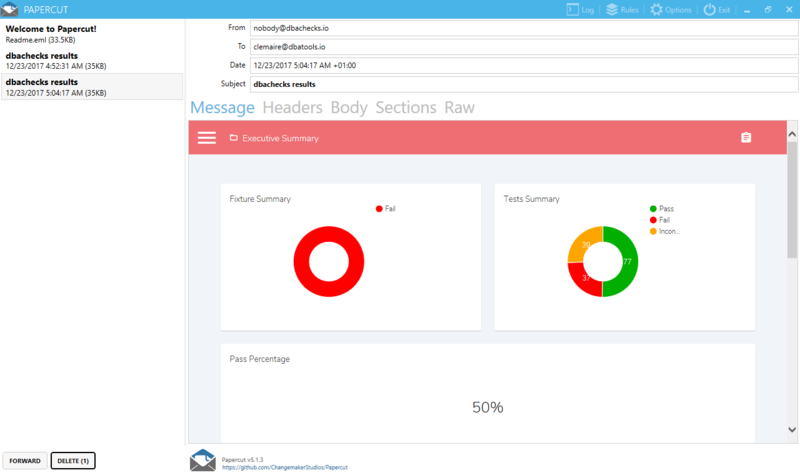 We've provided two options: Power BI and SMTP mail. We've also included a pre-built Power BI Desktop report! You can download Power BI Desktop from here or it is now offered via the Microsoft Store on Windows 10. Note: We strongly recommend that you keep your PowerBI Desktop updated since we can add brand-new stuff that appears on the most recent releases. To use the Power BI report, pipe the results of Invoke-DbcCheck to Update-DbcPowerBiDataSource (defaults to C:\Windows\temp\dbachecks), then launch the included dbachecks.pbix file using Start-DbcPowerBi. Once the Power BI report is open, just hit refresh. The above report uses Update-DbcPowerBiDataSource's -Environment parameter. We even included a command to make emailing the results easier! If you'd like to test locally, check out PaperCut which is just a quick email viewer that happens to have a built-in SMTP server. It provides awesome, built-in functionality so you can send the reports! Need to skip a whole test? Just use the -ExcludeCheck which is auto-populated with both Check names and Pester Tags. Set-DbcConfig persists the values. If you Set-DbcConfig -Name app.sqlcredential -Value (Get-Credential sa) it will set the SqlCredential for the whole module, but not your local console! So cool. If you have super specialized checks to run, you can add a new repository, update the app.checkrepos config and this will make all of your tests available to Invoke-DbcCheck. From here, you can pipe to Send-DbcMailMessage, Update-DbcPowerBiDataSource or parse however you would parse Pester results. Then add additional checks. We recommend using the development guidelines for dbachecks. Great idea! Remember that this module requires PowerShell version 4.0, which doesn't always mesh with SQL Server's PowerShell Job Step. To run dbachecks, we recommend you use CmdExec. You can read more at dbatools.io/agent. Then move them to somewhere in your $env:PSModulePath, perhaps Documents\WindowsPowerShell\Modules or C:\Program Files\WindowsPowerShell\Modules. Read more about dbachecks from a number of our original contributors! Know of any more blog posts about dbachecks? - Please add them here.